BMC Footprints is a complete, end-to-end flow for Incident and Problem Management solution. Being a part of a larger group of popular products that include RemedyForce, BMC Footprints enjoy some significant advantages, such as premium functionalities (i.e. view process flow, etc.). It offers a full range of tools that let users perform tasks such as change management, workflow automation, client management, and more. On top of that, it has a configurable interface that will allow you to build a work space that is personalized to your operations. The platform can also provide you with end-to-end business and IT solutions for a more streamlined workflow and faster service delivery. It's crucial to realize that virtually no service in the Help Desk Software category will be a perfect solution able to fulfill all the goals of different company types, sizes and industries. 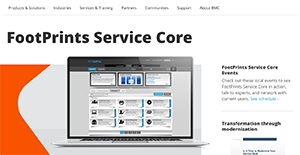 It may be a good idea to read a few BMC FootPrints reviews first as specific services may excel only in a really small set of applications or be designed with a really specific industry in mind. Others may function with a goal of being easy and intuitive and as a result lack complex features desired by more experienced users. You can also come across solutions that support a wide group of customers and give you a powerful feature base, however that usually comes at a higher price of such a service. Make sure you're aware of your needs so that you get a software that offers exactly the elements you search for. How Much Does BMC FootPrints Cost? We realize that when you make a decision to buy Help Desk Software it’s important not only to see how experts evaluate it in their reviews, but also to find out if the real people and companies that buy it are actually satisfied with the product. That’s why we’ve created our behavior-based Customer Satisfaction Algorithm™ that gathers customer reviews, comments and BMC FootPrints reviews across a wide range of social media sites. The data is then presented in an easy to digest form showing how many people had positive and negative experience with BMC FootPrints. With that information at hand you should be equipped to make an informed buying decision that you won’t regret. What are BMC FootPrints pricing details? What integrations are available for BMC FootPrints? Pros: What I like about this app is that it allows you to create quick descriptions and case templates. You can also access knowldege base articles and create reports that contain detailed analysis of ticket data all in one place. You can also perform surverys on customer satisfaction. Cons: The disadvantage of the app is that its interface is slow at times. Also, if you open a case it opens in a different window instead of another tab. Pros: First of all, I like its simplicity it doesn’t take lot of time to learn it. The process of adding multiple assignes to one ticket and escalating to other groups is useful. I really like this ticketing programs, the reporting aspect is powerful and we are able to create own reports based on specific criteria. The customer gets notification when closing the ticket. Cons: I think that it slows down the flow when working on or opening a ticket. The other thing that seems awkward is the fact when lot of people work on same ticket only one person who closes the ticket gets the credit. If you need more information about BMC FootPrints or you simply have a question let us know what you need and we’ll forward your request directly to the vendor.